Everyone who knows me personally knows that my favorite sport is basketball and the I am a die hard Detroit Pistons fan. I know that got swept in the first round of the playoffs (I digress). A huge part of my love for this team is because of their coach during the 80's and the 90's, Chuck Daly. Chuck passed away today, a victim of pancreatic cancer. Growing up in lower Michigan we spent an abundance of time watching or attending sporting events. From the Tigers to the Red Wings, there is something magical about the teams and the fans of Michigan. Detroit had never been a real power house on the basketball front, but that all changed when Chuck Daly showed up on the scene and took a group of very diverse (some would call misfits) individuals to championships, not once, but back-to-back! Chuck accomplished with such style and grace. He was one of the greatest coaches of all time in my humble opinion. I mean after Chuck, nobody else was ever able to truly coach Dennis Rodman. Not only did he coach the "Bad Boys", but he also coached the 1994 Olympic "Dream Team" to a gold medal. In fact he was the first coach to win both NBA and Olympic titles. 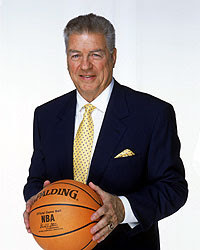 Daly was voted one of the 10 greatest coaches of the NBA’s first half-century in 1996, two years after being inducted into the Basketball Hall of Fame. Daly had a career regular-season record of 638-437 in 13 NBA seasons. In 12 playoff appearances, his teams went 75-51. He led Detroit Pistons’ in regular-season and playoff victories. NBA commissioner David Stern said, "Chuck did much more than coach basketball games, he positively impacted everyone he met, both personally and professionally, and his love of people and the game of basketball helped develop the next generation of coaches". Daly also made the right moves for the Pistons, who were notorious for their physical play with Bill Laimbeer and Rick Mahorn leading the fight, Rodman making headlines and Hall of Fame guards Isiah Thomas and Dumars lifting the team to titles in 1989 and 1990. Through it all Daly was able to take the team to the highest levels of play and taught his players what teamwork is all about. He laid the foundation for a style of play that still exist among today's Piston team. With all of his accomplishments, one of the attributes that sticks out in my mind was Chuck Daly's style. His dress was impeccable. He wore the nicest suits and everything was always color coordinated down to the socks! Former Piston John Salley gave Daly the nickname Daddy Rich for his impeccably tailored suits. The National Basketball Coaches’ Association created pins with the initials “CD” that many coaches and broadcasters are wearing as it dedicates this postseason to Daly. The organization also established the Chuck Daly Lifetime Achievement Award, which will be given annually. My heartfelt sympathy goes out to Chuck's family in this time of mourning. Rest in peace Chuck. That's sad news. I didn't know of Daly's passing, although I did realize you were a Pistons fan. I can imagine what their championship years meant fo you, and how Daly's passing kinda closes a fond chapter of your life. Speaking of Michigan sports, it was sad to lose the Bird too, a few weeks back. Hey Dell, Yeah I loved that era of basketball for sure. Malcolm posted about Bird, another great player in Michigan sports. Good call about Daly being the only one able to truly coach "The Worm". The outpouring of condolences from the sports/NBA world over the past few days is a testament to how much people loved and respected Chuck. There's a billboard about Chuck on US-23 North that caught my eye on the way home this evening. It said, "He turned boys into men and men into Bad Boys". Sad news. His passing is the end of an era. The Dream Team is still unbelieavable. I love basketball too Pjazzypar! came out of the b.room Chuck asked me my name and introduced me to Brendon like no big deal it was a highlight in the fact that I never mentioned b-ball I think he liked that he could talk to someone w/o b-ball coming into the conver.He was just the best and all around the league I never heard a neg. press story about him. Old School Friday - Who Is The Greatest?